ANDREAS KYPRIANOU has a degree in Mathematics from Oxford University and a PhD in Probability Theory from Sheffield University. He has held academic positions in Mathematics and Statistics departments at The London School of Economics, Edinburgh University, Utrecht University and, currently, Heriot Watt University. He has also worked for nearly two years as a research mathematician with Shell International Exploration and Production. His research interests are focused on pure and applied probability with recent focus on Lévy processes. He has taught a range of courses on Probability Theory, Stochastic Analysis, Financial Stochastics and Lévy Processes for the Amsterdam-Utrecht Masters programme in Stochastics and Financial Mathematics and the MSc programme in Financial Mathematics at Edinburgh. WIM SCHOUTENS has a degree in Computer Science and a PhD in Science, Mathematics. He is a research professor in the Department of Mathematics at the Catholic University of Leuven, Belgium. He has been a consultant to the banking industry and is author of the Wiley book Lévy Processes in Finance: Pricing Financial Derivatives. His research interests are focused on financial mathematics and stochastic processes. He currently teaches several courses related to financial engineering in different Masters programmes. PAUL WILMOTT has undergraduate and DPhil degrees in Mathematics. He has written over 100 articles on mathematical modeling and finance, as well as internationally acclaimed books including Paul Wilmott on Quantitative Finance published by John Wiley & Sons. Paul has extensive consulting experience in quantitative finance with leading US and European financial institutions. He has founded a university degree course and the popular Certificate in Quantitative Finance. Paul also manages wilmott.com. 1. Levy Processes in Finance Distinguished by their Coarse and Fine Path Properties Andreas E. Kyprianou and R. Loeffen. 1.3 Examples of Levy Processes in finance. 2. Simulation Methods with Levy Processes Nick Webber. 2.2 Modelling price and rate movements. 2.3 A basis for a numerical approach. 2.4 Constructing bridges for Levy Processes. 2.5 Valuing discretely reset path-dependant options. 2.6 Valuing continuously reset path-dependent options. 3. Risks in Returns: A Pure Jump Perspective Helyette Geman and Dilip B. Madan. 4. Model Risk for Exotic and Moment Derivatives Wim Schoutens, Erwin Simons and Jurgen Tistaert. 4.5 Pricing of exotic options. 4.6 Pricing of moment derivatives. 5. 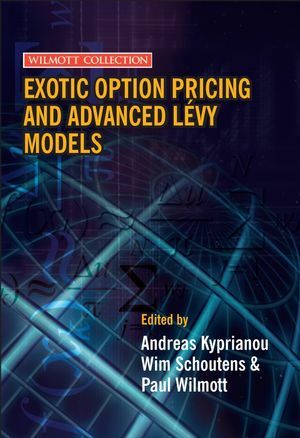 Symmetries and Pricing of Exotic Options in Levy Models Ernst Eberlein and Antonis Papapantoleon. 5.3 General description of the method. 6. Static Hedging of Asian Options Under Stochastic Volatility Models using Fast Fourier Transform Hansjorg Albrecher and Wim Schoutens. 6.3 Static hedging of Asian options. 6.6 A model-independent static super-hedge. 7. Impact of Market Crises on Real Options Pauline Barrieu and Nadine Bellamy. 7.3 The real option characteristics. 7.4 Optimal discount rate and average waiting time. 7.5 Robustness of the inverstment decision characters. 7.6 Contiuos models versus discontinuous model. 8. Moment Derivatives and Levy-type Market Completion Jose Manuel Corcuera, David Nualart and Wim Schoutens. 8.2 Market completuion in the descrete-time setting. 8.4 Enlarging the Levy market model. 9. Pricing Perpetual American Options Driven by Spectrally One-sided Levy Processes Terence Chan. 9.2 First-passage distributions and other results for spectrally positive Levy. 9.3 Description of the model, basic definitions and notations. 9.4 A renewal equation approach to pricing. 9.5 Explicit pricing formulae for American puts. Appendix: use of fast fourier transform. 10. On Asian Options of American Type Goran Peskir and Nadia Uys. 10.2 Formulation of the problem. 10.3 The result and proof. 11. Why be Backward? Forward Equations for American Options Peter Carr and Ali Hirsa. 11.2 Reveiw of the backward free boundary problem. 11.3 Stationarity and domain extension in the maturity direction. 11.4 Additivity and domain extension in the strike direction. 11.5 The forward free boundary problem. 11.6 Summary and future research. Appendix: Discretization of forward equation for American options. 12. Numerical Valuation of American Options Under the CGMY Process Ariel Almendral. 12.2 The CGMY process as a Levy process. 12.3 Numerical Valuation of the American CGMY price. Appendix: Analytic formula for European option prices. 13. Convertible Bonds: Financial Derivatives of Game Type Jan Kallsen and Christoph Kuhn. 13.2 No-arbitrage pricing for game contigent claims. 14. The Spread Option Optimal Stopping Game Pavel V. Gapeev. 14.2 Formulation of the problem. 14.3 Solution of the free-boundary problem. 14.4 Main result and proof.